It might at first seem a strange move for Madison Smartt Bell (author of Soldier’s Joy, Zero db, and Save Me, Joe Louis) to abandon his milieu of disturbed drifters and world-weary veterans for a period novel set in French colonial Haiti. And for the first 100 pages or so of All Souls’ Rising, Bell does indeed seem out of his element chronicling the daily activities of haughty 18th-century slave owners. But then one of history’s most violent slave revolts comes crashing into the novel and we are more firmly planted than ever in Bell’s disturbing territory of conflicting ethical systems. Once you’ve waded far enough in, All Souls’ Rising pulls you away with the tide and gives you a thorough drubbing for the next 400 pages. While the revolt was caused primarily by the inhumane treatment of the imported African slaves by their French masters, the uprising was also a byproduct of the revolutionary fever that had recently swept through colonial America and France itself. Before the collapse of the ancient regime, as a matter of fact, the mother country had made infant steps towards recognition of the rights of mulattoes (many of whom owned considerable amounts of property and slaves themselves). But now that the guillotine had toppled the economy of France, whites and slave-owning mulattoes alike were hesitant to conduct a social experiment in one of the country’s few remaining cash cows. And thus the bloody opening months of the slave revolt, which claimed thousands of black and white lives alike in the most hideous forms of torture imaginable. Bell dips into the chaos like a colonial Bret Easton Ellis, providing us all the details with an almost deviant relish. It’s only when the noble slave Touissant Louverture takes control of the African mob that a bit of civility returns to the war-torn country. 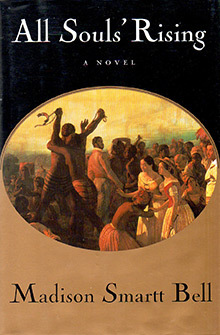 Bell chooses as his protagonists a mixture of admirable and despicable people caught up in fracas: a gentle French doctor who has come to Haiti in search of his lost sister, a sadistic plantation owner, a quixotic jungle priest who practices his own brand of Christianity, a lieutenant in Toussaint’s army that resents the “whitening” of the African troops, and of course, Toussaint himself. Along the way Bell provides a fascinating historical panorama of colonial Haiti, and one that reaffirms the author as one of extraordinary scope and talent.